It was a dark and stormy night, wind shrieked past the corners of the stuccoed dwelling splattering the driving rain onto the freshly washed windows. When, oh when would she learn to wait until April to wash those panes of glass which so lovingly let the coveted morning light shine into the familial home (for it is in San Diego that our scene lies). 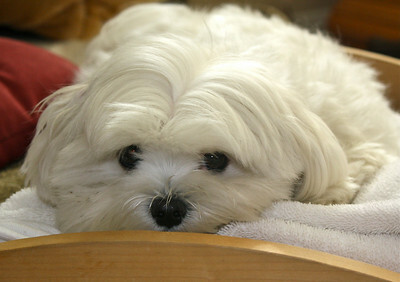 But in San Diego it doesn't rain, or it hadn't rained much more than the usual 10 inches or so annually until a year ago when the family obtained the two tiny balls of white Maltese fluff... the same fluffs who don't care to get their manicured toes wet when it's time to "do their business". The same fluffs who stand outside past bedtime on the soggy lawn (but not alone... no never alone...) with the somewhat impatient mother whose hair is wet even with the hooded protection of a somewhat too thin jacket. She stands there, coaxing the little fluffs, telling them that it will be a long night and that they should "go" now. But they are more interested in the flying leaves and the strange feeling of wind and rain on their teddy bear-like faces. Finally they are done and the mother returns with the wet and "not-so fluffy" Maltese fluffs to the warm and aromatic house. Aromas of beef and chili spices envelope the warm rooms of the house, for the mother had known it was going to storm and what better way to beat the unbearable (yes... it was in the low 50's...brrrr) cold on a stormy day than a hearty stew? Filled with vibrant butternut squash the stew was visually a sight for cold eyes. Chipotle chiles and a slightly spicy chili powder brought a warmth other than the actual physical heat of the dish, and the cilantro and pepper jack cheese brought a Mexican Chili-like flair to the steaming bowl of goodness. Pearl barley added a healthy fiber to the flavorful mix and the tender chunks of grass fed beef made the husband's spirits soar. With full bellies and happy heads, the family slept through the remainder of the storm awaking to gleaming but streaky windows and welcoming a new day. Heat oil in heavy large pot over medium-high heat. Add beef and onions and cook until onions are soft and the beef is beginning to brown, stirring often, about 8 minutes. Add garlic; stir 1 minute. Sprinkle chili powder and coriander over; stir and cook 1 minute. Stir in tomatoes with juice, beans, chipotles, and oregano. Add water to cover by an inch or so. Bring to boil, reduce heat to low, cover with lid slightly ajar, and simmer until beef is almost tender, stirring occasionally, about 1 hour (time will vary). Add the pearl barley and squash. Simmer, uncovered, until barley and squash are done and beef is very tender, about 45 more minutes. Season to taste with coarse salt and freshly ground black pepper. Add water to stew if necessary and to obtain desired "soupiness". Divide chili among bowls. Serve with sour cream, cheese, red onion, cilantro, and pickled jalapeño rings or your favorite toppings. That was an entertaining story to go along with a very cute picture and a delicious recipe! Holy heavens this looks awesome. I love butternut and beans together. I can't wait to try this. Honestly! It needs to be on menu next week. What a cute pup and a great story. I have a beagle and she will roll in the most disgusting things in the back yard, yet when it rains she acts to delicate to go outside. 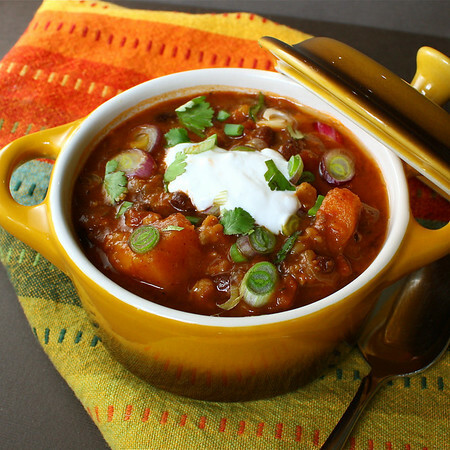 Great post Kim, this stew looks amazing, and perfect for these "cold" San Diego nights! oh, your little pup is so adorable. we're getting the rain here as well. not really used to it out here in so cal. even hearing thunder!! but it's a nice change of scenery. i don't feel so guilty about staying indoors and watching movies =) bean stew looks fantastic. Oh I LOVE this story! Your pup is gorgeous and so are the photos of that delicious stew... definitely something that can warm us up! You guys are dealing with rain while we are dealing with snow, once again...maybe another blizzard...blah. This stew looks amazing. I love butternut squash, but have never had it in bean stew before. I am definitely going to make this. Thanks! PS - Love the story. It sounds like everyone lives happily ever after. I loved your little story and your stew sounds so good, especially with the butternut squash. You need to get an invisible fence for your pups, if they aren't too small. When we bought our house, there was already one here, and we didn't have Bailey then. Just open the door, and out she goes, and then you can stay in the house. Looks wonderful, especially on a cold damp night like that! I love this, will have to give it a try. I never got this month's issue, I think my postman reads then first, he he. Your baby is adorable! Hope you are having a great weekend. The pup is so adorable- Lovely pic! and the bean stew looks hearty and sumptuous- Now I am seriously hungry looking at that bowl of stew. This dish is a bowl of sunshine. Those vibrant colours are guaranteed to inspire a warm feeling, whatever the weather. Is that cute ball of fluff Kona or Tavu? What a great idea! This seems so hearty (and easily adapted to be veg friendly!) Thanks for sharing! That storm sounds just right for this beautiful stew. Here, it's bright and sunny but very cold and very windy, so pass a little of that my way, would ya? This looks gorgeous and perfect for the weather! Mmmmm I love anything with butternut squash! Your puppy is so adorable!! And that stew looks so good. Makes me want to curl up with a good book and eat stew all day! LOL...that's the cutest little fluffs I have ever seen. The black bean stew looks divine. Beautiful picture. It sounds like the best black bean chili recipe I've ever seen (though I'd probably leave out the meat and cheese). 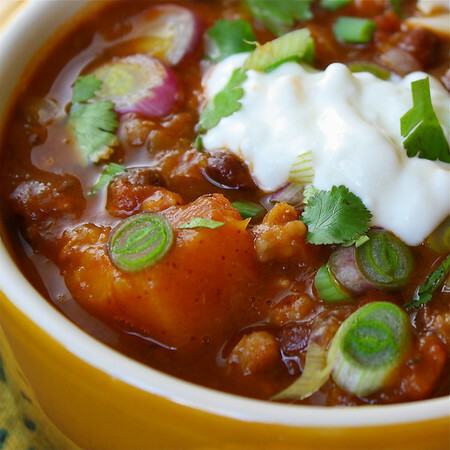 The addition of barley, butternut squash and chipotle chiles, that's great! I was fully captivated with your creative story! And I am definitely drawn to this amazing stew! Will be trying this soon! Love the little story. I've never actually cooked with barley before but in a recipe like this, it sounds perfect! I wish I was in San Diego. But the dish so suits Minnesota and our current snowstorm - spicy, warming, welcoming, hearty and I wish I had it in front of me. This looks fantastic! It has been rainy here in Phoenix too and this soup would be the perfect warm-up meal. I have made this recipe last night and I got really delicious test definitely i will regard this to my some close friends. Congrats on the Top 9 Today!!! We shared your storm and there's snow on the hills all around us. Congratulations on Top 9 - as always, you photos are gorgeous. Even though it's starting to warm back up in Texas, there is always room for stew, especially one that looks this delicious! This stew looks fabulous and healthy! I love the combination of black bean and butternut squash. Well done on the top nine! I am a giant fan of butternut squash; I love it particularly a warm homey soup. This stew looks like another delicious way to consume it, though - I can't wait to try it out. Beautiful pictures and fun story as always; thanks for sharing and contratz on Top 9 again! That seriously looks awesome! I love black beans! What a wonderful stew! The photos are great. Congrats on the Top 9 today! Sounds fantastic. Congrats on the Top 9. Ohh, your little "fluffs" are soooo cute! Your story made me smile ;) It's tough being a pooch in SoCal ;) Love the vibrant color that the squash adds to this comforting stew. Congrats on the Top 9! 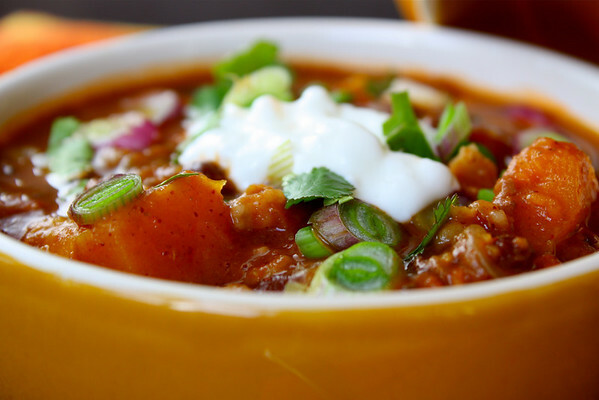 Kim, your soups and stews always make me want to hop on the 405S to the 5S and drop in at your house for some wonderful food :-) This is a totally different combination and I dig it! Great dish. It looks like an upgraded chilli recipe. Thanks. Your post is just adorable!! Butternut squash is one of my all time favorite vegetables and I love grass fed beef. I work with La Cense Beef, and I think they have the most flavorful cuts of meat. They have a great website with information on the health benefits of grass fed beef and you can also order meat online and have it delivered. Just thought you might be interested in checking it out. Its look really yummy, I have made it last night and i got really yummy test, my mouth is melting to seen it. I'm eating the leftovers as I write this. Wonderful flavors. Thanks for posting this! For you guys in the UK like me, you can buy Chipotle paste in most supermarkets (Discovery Brand). 2 x 400g tin tomatoes and 400g black turtle beans (soaked overnight) worked a treat. One word of warning - go easy on the chili powder and be careful with chipotle paste (1 tsp will do on your first go)!! !